Going forward, let's not discount the influence of history's recurring themes in how we redevelop the urban realm. So many discussions about cities today look only forward, without fully considering the past. We presume ways of life that must change for the better: Greener, more inclusive and shareable; global in orientation; away from land use regulations that favor separation of uses, and towards healthier, less auto-dependent realms. I do not believe for a moment that urban change is so simple. Without a longer view, we risk undervaluing lessons learned long ago. Height, density, use/control of land and public health in urban settings have evolved for a very long time. We can build on this urban history of reinvention and renewal and think more universally about how past, present and future define urban development. Last week, I went to Edinburgh, Scotland to see why this urban history matters. What is the value of historical perspective, particularly in the world heritage areas of central Edinburgh? Such focus goes far beyond common "brick and mortar" examples, such as castle ruins, statues of architect Robert Adam and William Wallace (Braveheart), a tower honoring author Walter Scott or St. Giles Cathedral. Rather, as urban thinkers such as Sir Patrick Geddes once stressed, the real emphasis is on the power of continuous human settlement---and inspiration gleaned from a dynamic city over time. The humble acceptance of the long-term reminds us, according to the Scottish architectural historian Miles Glendinning, that change is a constant, and that specific themes of long-term habitation can create broader ways of understanding the cyclical nature of urban reinvention. We know that rediscovery of the inner city is the raison d'être of many urban-dwellers today, and that dense urban cores are both increasing lifestyle choices and economic drivers from the regional to international levels. We now tend to disfavor sprawl as a solution to overcrowded conditions, and stress instead old standby's of increased height, cooperative living spaces and smaller dwellings. But places like Edinburgh's world heritage areas show that our current ability to meet these goals safely is reflective of lessons learned long ago, when overpopulated and unsanitary conditions within city walls eventually inspired new understandings of urban disease control. Within medieval Edinburgh, buildings as high as 11-15 stories once flanked the High Street (Royal Mile) as it crossed in linear fashion from Edinburgh Castle to Hollyrood Palace. The upper classes lived on upper floors. The poor lived below. Waste disposal competed with walking and commerce in the closes, wynds (alleys in today's parlance) and courtyards of old, as sewerage found its way to the small lake (the Nor' Loch) then flanking the city's northern boundary. Later, wider streets cut into former closes and wynds, while others remained intact. Such early governmental interventions brought light and air to former "high rises" and underground dwellings, and the eventual transition of the polluted Nor' Loch to gardens at the base of the Old Town. Today, Edinburgh's Old Town is part tourist, part retrofit. The medieval shell survives, but living conditions are now consistent with a modern age. Historic venues such as the Royal Mile have new roles, and captivating visuals such as the bend in West Bow Street replace the rudiments of life within the walls with the trends of today. What lessons emerge from buried, medieval closes and formerly inhabited, forgotten building vaults of the Old Town? In a tour of remaining portions of several abandoned underground medieval closes covered by building foundations since the 18th century, I saw eerie parallels to today's reinvented urban alleys and laneways, apodments and live-work dwellings--the medieval spaces evolved without the banner of pestilence--back to the future, with modern gloss. Similarly, it was not hard to see how today's urban redevelopers can repopulate the shells of the past when opportunity strikes in a more modern form of infill. In 2002, a fire destroyed a group of Old Town tenements (termed a "rabbit warren" by firefighters) next to the historic Cowgate area. Edinburgh-based Whiteburn worked with planners, heritage groups and the community to assemble eight formerly disparate properties and redevelop the area into a mixed use venue including a new hotel and grocery store. And what of the neoclassical New Town, the city planning marvel centered around stately squares and avenues, authored by competition winner James Craig in 1766-67? The planned New Town was nothing short of a period-piece, stately reinvention of the original urban core, which quickly became a residence for the wealthy, and provided gateway to later expansion as the city grew. Now a commercial hub at the base of the Old Town, it largely retains the Georgian grandeur of its original design. My sense of the New Town's legacy? Its physical form provides testament to the power of interventionist planning when a municipality has a broad swath of land assembled for a common purpose. In this case, Scotland's unification/military peace with England tendered the Old Town's walls irrelevant after the mid-18th century, and an earlier royal grant had made the land available. Today's Edinburgh still benefits from the wide spaces of Craig's plan, which so profoundly contrasts with the tight scale and former living conditions of the Old Town above. In the end, the historical perspective presented here raises interesting questions about the nature of urban change, and how a global economy integrates with an evolving urban artifact. In Edinburgh, integrity issues began long ago, and continue, with classic historic preservation debates along the Royal Mile and the construction of the controversial Scottish Parliament on the site of the old Hollyrood Brewery ---not to mention railroad incursions of the nineteenth century and much-debated urban malls in the New Town. But to an American observer from Seattle, one hometown image---the Starbucks logo---particularly stands out. In the photograph below, storied history and modern lifestyle communicate their "age value" to one another from a vaunted wide avenue of the New Town. Looking up from the New Town's George Street, midway between St. Andrews and Charlotte Squares, medieval past and global future speak to their uniting element: human ingenuity and reinvention, across the ages. 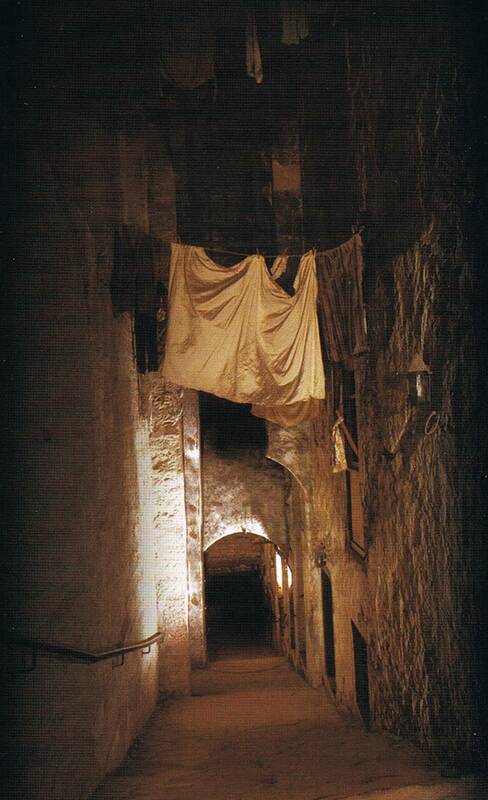 Images composed by the author in Edinburgh, Scotland, with the exception of the photograph of Mary King's Close, obtained from a distributed photograph by The Real Mary King's Close, Edinburgh. Click on the images for more detail. © 2009-2014 myurbanist. All Rights Reserved. Do not copy.